According to a German news station, the operatives who killed Al-Qaeda's leader weren't US Navy SEALs. In fact, they weren't even from this century. German news station N24 was quick to report on the death of Bin Laden at the hands of Navy SEALs. 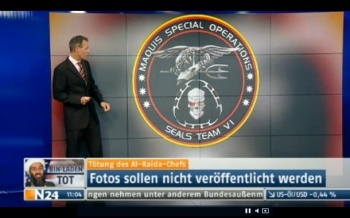 In its rush, however, N24 could not apparently find the actual logo for Navy SEAL Team Six, and instead used the logo for the Maquis Special Operations Seals Team VI. Which wouldn't be so bad, except the Maquis' Seals Team VI is actually a group of terrorists. More specifically, they're a group of terrorists from the 24th century on Star Trek. Whoops. According to TrekMovie.com, presenter Mick Locher even commented on the logo: "They don't have the skull in their emblem for nothing." Except that the skull is clearly that of a Klingon, surrounded by the Klingon's ancestral bat'leth weapon. And the eagle in the middle is holding what looks to be a phaser. Oh, and apparently, the logo itself wasn't actually official, but rather the work of devoted Star Trek fans, completing the cycle of failure. This is just one of those things where you just kind of shift in your chair because it's a bit awkward. Awkward, and also hilarious.